Stainless steel is not appropriate for knife blades as it cannot be hardened. Therefore Berndorf hollow handle knives use high-grade hardened steel blades which are inserted into the knives. Where the extravagant, modern design does not allow this technique, the entire knife will be forged out of a special- quality blade steel. Pure silver is the classiest material for cutlery, but on its own is very soft. To harden it, 925 sterling silver is alloyed with 75 parts of copper. This produces real silver, which is also referred to as 925 sterling silver. The “Alpacca” alloy (copper-nickel-zinc) is the basic material for 90 g silver-plated cutlery which was invented by Berndorf more than 160 years ago. Alpacca almost has the same specific weight as real silver and, when silver-plated, looks virtually the same. 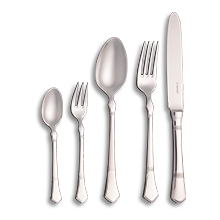 However, nowadays we also use stainless steel as basic material for silver-plating with modern flatware designs. Stainless steel, sterling silver and silver-plated Alpacca can all be washed quite safely in any dishwasher. How you keep your knives gleaming and sharp will be explained to you in the care instructions we provide with every canteen of cutlery.